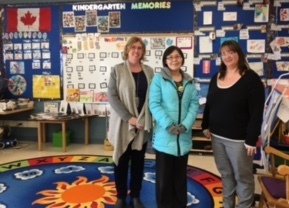 Arlene Komangapik, Student Support Assistant from Ulaajuk School in Pond Inlet, Nunavut, traveled to Southern Ontario to help create sound field system training videos, a project supported by Phonak Canada (manufacturer of the sound field systems used by Bheny). 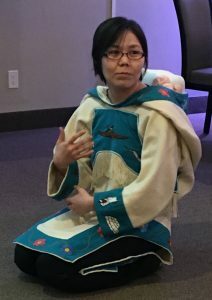 Arlene recorded videos on topics such as how to use the systems and accessories, and how to troubleshoot and fix problems when they occur, in English and Inuktitut. It was wonderful to have such a competent, bilingual person offer her time for Bheny. Thanks also to Peter, Lara, Sarah and Ben from Phonak who provided equipment and videotaping expertise. These short videos will be available in all Qikiqtani schools for training and technical support, and will complement the print materials already available in English and Inuktitut. 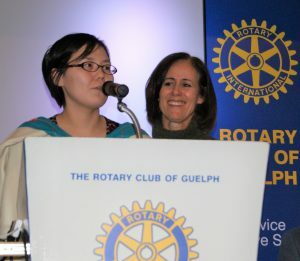 Also during her trip south, Arlene shared cultural information at a Guelph primary school, a Rotary Club of Guelph Indigenous Committee meeting and many other opportunities. Everyone truly appreciated her insights.